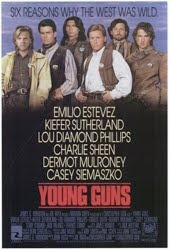 Patrick is joined by Mike Pomaro for a discussion of 1988's Young Guns, the Brat Pack, the current state of the western genre and the merits of Firehouse's "Don't Treat Me Bad." hey dog,did you see the size of that chicken! I know it's not technically a movie, instead a miniseries or whatever, but Lonesome Dove is by far the best Western to come out in the last 30 years. (With the disclaimer that I haven't seen Unforgiven.) It probably ranks up there in the top 5 of all time best Westerns.